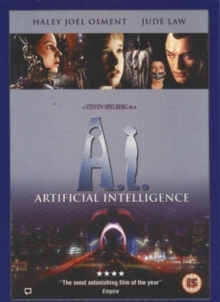 Based on an unrealised project developed by the late Stanley Kubrick, 'A.I.' tells the story of David (Haley Joel Osment), the first lab-built artificial child capable of feeling real emotions. Based on an unrealised project developed by the late Stanley Kubrick, 'A.I.' tells the story of David (Haley Joel Osment), the first lab-built artificial child capable of feeling real emotions. David is adopted by Monica and Henry Swinton (Frances O'Connor and Sam Robards), a couple whose own biological child has been placed in cryogenic suspension awaiting a cure for a currently fatal medical condition. The Swintons seems to adapt well to the new child in their lives, but when their own son is cured and sent home, it jeopardises David's position in the family and he soon finds himself all alone on a dangerous adventure in the outside world. David is adopted by Monica and Henry Swinton (Frances O'Connor and Sam Robards), a couple whose own biological child has been placed in cryogenic suspension awaiting a cure for a currently fatal medical condition. The Swintons seems to adapt well to the new child in their lives, but when their own son is cured and sent home, it jeopardises David's position in the family and he soon finds himself all alone on a dangerous adventure in the outside world.